Weren't able to make our January 9th webinar about getting started with Revibe Connect, or want to rewatch it? Lara Hill: If you're just now joining us, welcome. This is a webinar about getting started with Revibe Connect. This information is geared mostly for our customers of Revibe Connect, although if you don't have a Connect and you're just curious about how it works, we will be walking through all of the features, the setup, the app, basically everything you need to know to get the most out of your device. I'm going to be passing off to Emily West, she's our operations specialist and she's going to go through all of the details about how to get started. Emily West: As Lara was saying, my name is Emily. I am the operations specialist here at Revibe but if you've ever called in, you most likely have spoken with me before as well. As she was mentioning, I'm just going to go over basically first steps, as soon as you get your Revibe, unboxing, what all is going to be inside. Let's go ahead and jump into that. First thing's first, get your Revibe in the mail. As soon as you open it up the first thing you'll see is your device. What you want to do is go ahead and take that out, the full insert as well. Inside you'll have your charging cable, and then you will also find your user manual. There's also a letter from the CEO, Revibe quick tips, and then there's also a little page on quick start. If you didn't receive these in your box, we're going to share a link at the end of the webinar to an online resource that has all of these so you can read that. So then once you've taken all of that out, take your band out, you can go ahead and put it on, just adjusting for fit. So basically you want it to be snug, but not too tight. It doesn't have to be extremely tight to be effective. This is a size small, just for reference. I'm going to put it on just like so. You want to wear it on your dominant hand if you can. I'm not left-handed, but just for the video purposes, put it on this hand. And a neat little thing about the box is that it's also a charging station. So once you've taken everything out and you've gotten your little insert, to set the charging station up you just flip this upside down like so, and then you place this side into this side of the box. So where it says "charging station", you want that to face the little charging hole. So to charge it, take your charger, you unplug it, and then ... after I've unwrapped it, and then we'll go over what you see on your device once it's charging, and then we can go. So to put it in the station, you're going to take out the hardware piece, so you just push it down, and then take the band of. And there's a nice little spot for your band, you put that in there and then you put your hardware piece in just right here. So it sits in there nicely. Just on the top, oops, I tipped my box over, sorry. It rests on the top and then you can put the charging cord just right through this little hole and into your hardware piece. And this is nice just to have everything neat and tidy. At the end of the school day, you come home and just get it charging and then good for the next day. So when you have it charging, you'll see the little lightning bolt. When you first get your device, you want to fully charge before you get it set up. This can take up to three hours. And then once it's fully charged, you'll get a nice full battery on the display itself and that's how you know it's ready to go. Then you're going to want to download your app and the app is going to take you through the entire setup. If you're following with the setup wizard, it's super helpful, you can get everything through there, which Daniel will go over a little bit further. As far as the device goes, it's water resistant, not waterproof. So you can wear it when you're washing your hands and it's totally okay but we don't recommend submerging it in water. As far as the clock goes, if you want to see the time on your device, it doesn't show constantly just to preserve that battery life. So right now I've just take off the charger, the battery is low, as you can see indicated. We'll wait for that time to go away so can show you how to tap to see the time in just a second. So we have it blank right now, you just want to give it one tap and the time will appear. Two taps won't do anything to trigger the time, just want to give it one tap. And then as far as tap backs go for each of the modes, if you're in adaptive mode you want to be tapping back when you receive your vibration reminders just so the device can collect the data regarding focus score, attention span, response rate, things like that. So when you're tapping, you want to make sure that you're waiting for the entire vibration sequence to finish. So when the vibration reminder is triggered and it goes off, wait for it to stop and then for the prompt to appear on the screen. The prompt has like a little exclamation point on the left-hand side with two dots and a check and one dot and an X to represent two tap backs if you were on task and one tap back if you were not. And then after you've given your response, the device will vibrate accordingly to whatever it recorded from you. So if you tap back twice, you should feel two vibrations in response, or one if you tapped once. And that's just how you can check to make sure that it got your response. If you're not in adaptive mode, you don't have to tap back, it's not required. That's in the low, medium, high, and homework modes. You definitely still can, but you don't have to. The other modes can be changed. If you want to change the mode, you do this through the app. It's through user preferences and you can change the mode to off, which just means no vibration reminders will be sent. Text reminders are still active, but the vibration reminders will not be sent. There's adaptive, low, medium, high, and homework. And all of those basically are explained in the user manual, but to give just a brief overview, adaptive mode is the one that will adjust in real-time to the user and the user's needs. So say it vibrates and you're not on task. You'll tap back once and then it will know to send more frequent reminder vibrations to help you stay on task and get on task. And then if you respond that you are on task, it will know to send less frequent reminders so that you can keep on doing a good job. Low mode is if you're doing pretty well, you're on task, and you want more consistent reminders. They're going to send about every ten minutes. Now that's an average, so it could range anywhere from eight minutes to twelve minutes. Never exactly ten minutes so just so you don't expect it. Medium is if you're moderately distracted, so this will be about every seven minutes, but again it's a range. And then high is if you're pretty distracted and you need more frequent reminders, so it's around every five minutes. And then homework mode uses a Pomodoro method so it's got 15 minutes of work time, you'll get a vibration reminder every three minutes for 15 minutes, or no, I'm sorry, let me double check myself. Lara Hill: Yeah, I think that's right, Emily. Emily West: Was I right? Yes, every three minutes and then you'll get a little break afterwards. It'll queue you to take a five minute break and then the process will repeat itself. So those are all of the modes. And like I said, tap back's only required for adaptive. You don't have to tap back in low, medium, high, or homework. But you definitely still can. And then all of the others settings, like if you want to turn the clock off, if you tap and the time shows but you don't want that, you can also do this under user preferences as well, you just disable the watch feature and that way the clock will not show up on the device if you find that that would be distracting for you. And most of the other settings are also changed under that user preferences screen as well. And with that said, I'm gonna give it away to Daniel to go over the setup wizard and going through the app. Daniel Baggott: All right. Sounds good. So my name is Daniel, I'm part of the Revibe tech team here. So that was a good overview of the hardware. This is going to be a overview of the app. So the app is where you will do things like look at your data and see assorted data, for example steps, that you can configure, options like the watch face, and you can pull insights from your attention tracking. So we'll take a look here. So this is what you'll first see when you start the app. This is the setup wizard. This helps you get a user set up and a device and connect the two, so that's the setup wizard is about. At the very end of the setup wizard, you'll also have a chance to set up a schedule. So after the setup wizard, you've got your user, your device, they're set up. Let's take a look at the schedule here. The schedule is what will hold all of your different items here. So for example, let's say you have a class. You have history. You can click anywhere on the schedule and you can pull up and make either a text reminder or create a class. Classes are what will hold your vibration reminders. So if you schedule events on your schedule, vibration reminders will be provided within those classes. So we'll go ahead and create a class here. We'll call it History. We will set a start time, 10:00 AM, and we will set it to every weekday. Go ahead and hit Save. So you can see the events here. Blue events are classes and green events are reminders. Reminders pop up on the device at the scheduled times. They are text reminders that can be scheduled throughout the day. And to add a text reminder, you can either click this plus button on the bottom right or you can click anywhere on the screen and create a text reminder. Again, these descriptions are available right here. So you've got your schedule set up, what does that do? Again, that provides the vibration reminders within the classes. Additionally, it helps in the adaptive mode. So the adaptive mode will scale for each class. So for example let's say you have a class, Math, where attention might be suffering. Adaptive will scale in that math class across the days. But let's say History attention is not struggling, so it will scale accordingly in that class across the days. So it also helps with adaptive mode. So we've got the schedule set up. We've got the device set up, we've got the schedule set up. Let's take a look at these different modes. So there are customizations available on the device. Let's take a look at some. So we'll go to the device, we will go to the device preferences. And here we've got options for advice. Throughout the app you'll see these information bubbles and you click on them for more information. So if you're wondering what are these modes? Click on the information bubble and you've got an overview of these different modes. So just to give an overview here of these different modes, again, we've got homework, which is the Pomodoro, low, medium, high, and then our adaptive mode which reacts accordingly to the schedule. So that's the favorite and recommended mode. However these others can be useful in different circumstances. So you can disable the clock for example if that it's distracting to the user. And these other information that you can add help with different insights. So for example, height can be used to measure the gait in walking and counting steps. So these are useful for pulling out additional insights for you later on. So we've looked at the schedule, the modes, let's go ahead and look at how to sync with the device. So syncing with the device is where you will push all of the changes that you've made over to device and get all the attention tracking data back. It's basically getting the device up to speed and getting all of the new information from the day. So we recommend you sync once a day. The device holds almost two days worth of data so you could sync a little bit longer. You won't miss much data if that happens. If you forget to sync a day, that's all right. We recommend syncing daily. So we've added a new option which is not actually available right here on this screen, but you'll see it in the app. It is called quick sync. So our normal sync takes between five and 20 minutes to complete. But this quick sync takes 30 seconds to complete. We recommend quick syncing once daily. Additionally we are rolling out updates through the end of February and they will reduce the sync time for the straightforward sync by over 50%. So straightforward sync will become much faster, but we recommend quick sync right now. So the difference between quick sync and sync is quick sync skips Fidgets. So what are fidgets? And what is the other information that I'm getting? So if we look here at the dashboard, we can see information that we're getting and we can see steps and response rate and focus rate. I'm going to turn over to David to describe these in just a minute, but before I do I'm going to give you a couple tips on syncing the device. We recommend that they be close together before you sync them. We recommend that you have wi-fi enabled. It increases the stability of the connection. You're internet drops out part way through the sync, the sync will fail. That might be obvious, but it's hard to tell when your internet drops out. So we recommend being on strong wi-fi. Additionally we recommend that your devices are all charged. Sometimes if you have a new phone that's not fully charged, it can lower the connection and then the sync can take longer. So information tracking. This information that's come back, your focus tracking, we can see that we've got indications right here of different progress throughout the day. So great progress is over five percent change, and you can click on these for more information. And then there's within five percent, which is a thumbs up. And then we've got other ways we can view the information to allow insights. So we've got day, week, month, and we can view these. I'm going to swap over to this view right here. So we've got day, week, month, and then we've got an advanced tab. And in the advanced tab we can choose custom date ranges and look at the attention tracking for that date range. So let's say there was something going on outside of school where you were wanting to see your progression between semesters or quarters, you can choose a custom date range and compare them. So you can see there's all kinds of information available here and you can even sort it by the different blocks in the schedule. So if you want to see history or math or work in different times, you can check and change view by schedule blocks. We can see that all the information is available here. This is a very powerful tool. Additionally we will be coming out with more provided insights, but there's quite a bit here to dig into your attention tracking data and find neat things. It's also empowering to see that you're attention is going up over time. And it requires less external input that allows you to help improve your own attention, focus, over periods of time. And then see that your attention is improving as well. So with that, I'm going to turn it over to David who will describe some of these tiles and what exactly they mean. David: Thank you very much Daniel, great job. So what I'm going to do is I'm going to start from the bottom-right and I'm going to move up to the top-left. But before I do that, I really want to talk about how the data is collected. So the data is collected in two ways. The first way it's collected is with the accelerometer and the gyroscope. So inside your Revibe device is an accelerometer and the gyroscope. And those two devices are collecting data at the unit level. So regardless of any interaction that the person may have with the device, that is just collecting data. And the second way that data is collected is through tapping. And tapping is user-generated. And Emily did a phenomenal job talking about tapping, but basically when the unit vibrates, you tap twice if you're on task, you tap once if you're off task. And I'm going to talk a little bit about that going forward as it relates to how you might want to work with your kiddo related to discussing the tapping process. As Emily talked about, in certain modes you do not have to tap back. When starting to look at the data itself, we'll start off with Fidgets. So the bottom-right-hand-side there is Fidgets and that is a great deal of data. Part of the syncing process and the length of time it takes to sync is us pulling that fidget data over. Basically the accelerometer is a six point accelerometer and it is gathering all types of movement data. 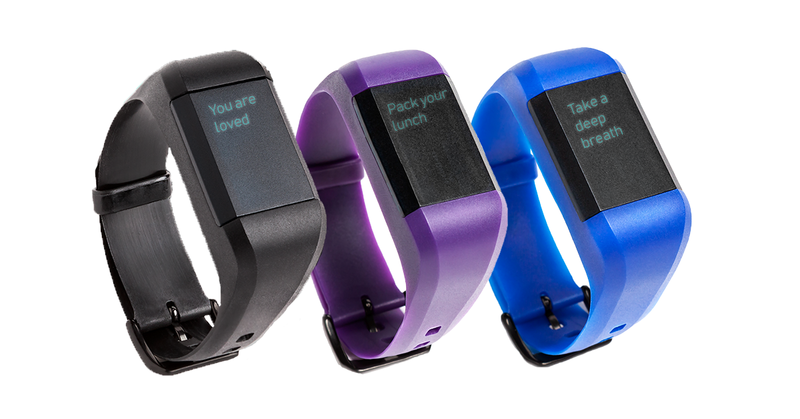 The wrist that you're wearing the device on is really the gateway to almost all body movement. 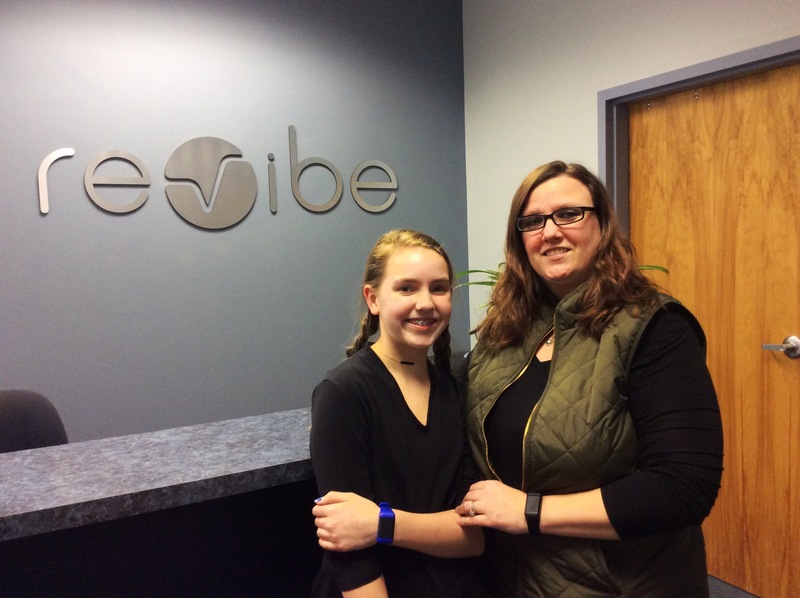 And what we've done with the Revibe is we've taught it through machine learning to understand the difference between raising a hand and a fidget movement, between typing and a fidget movement, and writing and a fidget movement. So when it feels a writing movement it doesn't register as a fidget. When it sees a raising hand movement, it doesn't register as a fidget. If it get a hand raise, it doesn't register as a fidget, but all movements, all of those type of other movements on the body will be registered as a fidget using the accelerometer. Over time we'll be able to tell exactly what type of fidget it is as we increase the fidelity, whether it's a hip fidget, a side twist, a shoulder struggle, leg movements, to get the type of information we're getting, it's a significant amount of data. And then the gyroscope is collecting steps. That's the step tracker. Basically fidgets are represented in terms of minutes. I think, Daniel, if you can move to where I have some fidget data on the apps, I think you have access to it, I'm a pretty fidgety person. And that's really the first thing I learned about myself as I'm wearing it, this is me for December 26th, I think. Oh that's good Fidget data there, Daniel. He's moving it around a lot now. Well anyways, there's a good day, it seems I had a lot of steps. I'm a very fidgety person and I've noticed that with the app. And I've also learned where my fidgets are, when I have more fidgets in the afternoons than I do in the mornings, so that helped me out as well. The whole idea of focus and the whole connection with fidgets is still being talked about in the industry. We're not telling you whether a fidget is good or bad, we're just able to register fidgets for you and you can start looking at some correlations over time. We're going to be doing a lot more research and a lot more conversation around fidgets as well. And then of course you have steps and that's the gyroscope. Now the rest of the stuff we're going to talk about, the middle two tiles and the top two tiles, well the middle two tiles first and foremost are tied to tapping. And this is where the tap back comes from. And we did a lot of research on tapping because of what we knew would be concerns about whether people would tell the ... would the kiddos tell the truth? Would even adults wearing it tell the truth? Ultimately, would it be inconvenient? Would it be another distraction? First and foremost we found that when positioned appropriately, people do not lie about ... and the kids in the research study did not lie about it. Ultimately, when talking with them about achieving their goals, which is getting better, which is managing your own behavior, and this is what we're talking about is helping them manage their behavior and all the tapping is doing is helping them track that, that they understand the power of self-reporting appropriately and honestly. 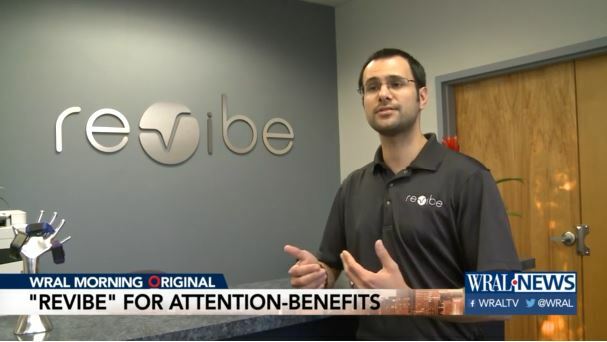 That's really one of the best tips we can tell you as it relates to tapping is make sure they understand that ultimately the Revibe is about vibrations that get you back on task. All the tapping is doing is looking at trends. If you're tapping yes all the time, even though that's not correct, there's no value in the trend data, and long term there's really no value and growth for the person who's wearing it. So you want to talk and they want to be talking about that ability to self-improve and manage their own behavior. And that's the other thing I want to talk about, is our goal is for folks not to stress about the specific data points and look for improvements and constantly looking for the thumbs up and the rocket ships. What you want to look at is long-term trends. How are the long-term trends looking? And also you want to be seeing what's going on as it relates to feedback from your teachers. What are the teacher's saying in the classroom? What are they saying about themselves? Are they feeling more empowered? Are they feeling like they have more control over their activities in the classroom? And are you seeing improvements in their grades and their overall having a much better, brighter, positive mindset associated with schooling and the schooling process? So when you start looking at the data now, the response rate, that's the the one on the right-middle, the response rate is the number of responses divided by ultimately the number ... so the number of responses that you responded when the unit vibrated. So my response rate on this day was 51%, so 51% of the time I responded to the unit when it vibrate. Now my focus rate is 95%, that's when I did respond, I was on-task. So 95% of the time, when I responded, I was on-task. So the first thing you want to look at, you want to look at the response rate. So is the wearer engaging with the unit? Did they completely miss the vibration? Were they not paying attention? And you can see that and there is a number of occasions where I just wasn't paying attention, I missed a vibration, I was off doing something else, I wasn't really focused on it. And then vibration rate is okay, so when I felt the vibration, what was going on? And then you want to look at ultimately where does the person stand with regard to how they're responding when the vibrations come in. Now going to the top, the top two scores are where it gets a little bit more esoteric, where the technology is taking over. And really the attention span is looking at the number of times that somebody is responding yes in a string and the average of times that they're responding yes in the string versus average time they're responding no in the string and then taking that average time over a period of time and coming up with attention span. Understanding that in adaptive mode, like Emily was talking about, it may not vibrate if you're on task and consistent, but every 15 to 20 minutes. If you're not on-task, it might be vibrating every six to seven minutes, and then how you're responding in there will ultimately generate an attention span for you. And then your focus score is looking at your overall progress against everything. Response rate, how are you responding when you do respond, length of time your attention span is growing, and then ultimately will include all the elements in there. And with the focus score, again, we're really looking at the consistency when you think about trends over time. And that's the key thing here. You're looking at trends. You're looking at positive feedback as it relates to the people who are working with your child day-in and day-out, whether it's a school psychologist, whether it's the IEP instructor, whether it's their teacher. And last and foremost, as Daniel was talking about, that Advanced tab, when you have that advanced tab and you can really dig in at the class level and look for trends at the class level if you have specific classes set up or specific times to see if there's a specific course or a specific time a day where they're having challenges that you can try to do some interventions associated with. Finally, our goal is to start sending you out insights. Insights based on things the data is seeing that you might not be seeing related to steps or fidgets, time response rate, tied to time of day, tied to class time. So that's my section and from there I'll pass it over to Lara. Lara Hill: Great. Thanks, David. A couple a notes about what David was saying with the app in terms of updates coming up. We are going to be continually improving the app, so we'll be rolling out updates. Keep an eye out if you notice that there's an update available to the app and make sure and install that because we have some significant improvements that we're working on and that's another reason why it's so important that you reach out to us if you have any suggestions or feedback or concerns about anything related to the app or to your experience using the device. I'm going to try and share my screen for a couple a more resources I wanted to share. If you go to our website revibetech.com, depending on when you ordered, you may not have seen some of these new resources that our marketing team has been generating. We do have, you scroll down to the bottom of our home page, there is this Helpful Resources link that includes a Quick Start Guide and some of you may have received a printout of this Quick Start Guide in your box, but we do have, also, some quick tips here as well as at the bottom of this page, there's a link to a PDF that you can print out for your teachers, or if you have intervention specialists or any clinicians that are involved that you would like to just give them a quick overview of what this device is and what it does, we made this PDF that just basically explains how it works. So this is just a easy one-page printout that you can send out and you can either grab a link and send it to them by email or you can print it off and send it with your child to school, and that's a great way to keep the other people involved in what you're trying to do with this intervention. It's helpful to have teachers on board and supporting your efforts with this lifestyle change that you're implementing because they can also help you to get real-time updates. That's a question we get sometimes is, "How do I get real-time updates while my child is at school?" Well if you have a teacher or a counselor or someone at school that's willing to also install the app on their device, maybe they have a classroom iPad or some other device that they can install the app on and we can sync your child's device to their device and that way you can get more frequent updates on how things are going. Another interesting tip that ... or another question that we get a lot is about how to improve the syncing times, like if it's taking a while to sync. That's a issue that you might check for an update. Look and see in the app store, if if you're on a Android, the Google Play, and just notice if there's an update. Sometimes there's one available and it will significantly improve the sync time and there's other improvements that we roll out as well. Going through some of the other questions, and Emily chime in if you see some in the chat that we need to bring up, we had some questions about the Plus plan coming through, so I just wanted to also pull up, most of you probably are part of our Plus plan. If you bought the Plus package then you are already rolled into this Plus plan which gives you these advanced features as well as protection. If you just got the Connect device without the Plus plan, you are currently on a free trial of the Plus plan, so you're getting to see all of the advanced metrics and features that come with that. I just wanted to let you know that this does come with loss protection. So if there is anything that happens to your device, I know that's a big concern with parents, just let us know and there is a small fee for that, but it's something ... it's not like you're going to have to buy a whole nother device, that is part of the Plus plan. We also have the replacement warranty if anything happens at all to the device, you can just send it back, we'll send you a replacement if you're part of the Plus plan. The other thing I wanted to mention is the adaptive mode which some of you have probably been trying with the tap backs and the adaptive mode is part of the Plus advanced features that allows the device to learn your child's needs. Some people have been ... I've been seeing some comments on the chat saying that they're using the adaptive mode but then they don't get as many reminders. It might be that you're tapping back that you're focused so it starts to learn that maybe you don't need as many reminders at certain times a day. But if you're still wanting more reminders, you can always go back to a different mode. We also still have the low, medium, and high. If you just want a different frequency you can choose the high it can send you very frequent vibration reminders. And as Emily mentioned, you can still tap back if you're in low, medium, or high, you can still tap back. The other thing I wanted to mention is we do have the 90-day return policy, if for any reason you're not satisfied, please reach out to us. If it's something that we can fix or help you with then we would love to work with you on that. If it's just not for you, it's not a good fit, whatever reason you decide you'd rather just get a refund, please keep in mind it is 90 days, so we give you a full three months to try it out. If you do have any concerns and do want to return it, u can just come to our Contact Us page and just reach out to us, just let us know and we're happy to cover shipping both ways. We'll send you the return label and that way you just print it out, drop it in the mail, and we try to make it as easy as possible because if it's not working for you, we don't want you to keep that device. We want you to let us know, send it back because really our goal is to just find something that's going to be helpful. So that's one reason why we do reach out for feedback. You'll see in your email a request for a review. This is our attempt to find out how things are going and if something's not right, we'd love the chance to make it right and see if we can make it work. And if things are going well, we would love to hear about it so please let us know. We would love to share stories. If you have a success story, we'd love to share it, whether that's an anonymous share, we could leave your name out of it, or if you're willing to share that publicly some people like to do just first name and last initial or some people are comfortable sharing even just on a video testimonial. So since this is a new product, we are still looking for customer feedback, customer testimonials. So please do keep that in mind. If you have a good story to tell, that's really helpful for that people to just see and hear real-world stories of how this device is working in schools. We just recorded our first video testimonial this week, so you might have seen that on Facebook, we had a really great story from a mom who shared that it was just absolutely life-changing that her son was really making significant improvements and the teachers and the intervention specialists were just so impressed and this was only after a week and a half of wearing the device. So this was a really great story. We do want to share those with other people, there's a lot of people that it helps to hear those kind of real-world situations. So please feel free to reach out to me if that's something you're interested in sharing and you can reach me at Lara, L-A-R-A, at revibe tech dot com, or of course our support team is support@revibetech.com. So please do keep in touch and let us know how things are going for you. I think we're getting close to the end here. I do want to check in, is there anyone else from my team that's seeing any questions that we need to talk about before we close? David: Do you want to offer some questions to the group? Give them an opportunity, either texting them in at this point and we read them out loud? Lara Hill: Sure, we still have some time if there's anyone that wants to chat in their question. I see Alison, hey Alison. I wanted to read her question. Can you switch between kids? And I know Alison, she's a good friend of mine and I know she has three, well now she has four kids. So she's probably wondering if you can use the same device for different kids. And you can certainly do that. The data's all going to be set up under the device, though, so if you wanted to be able to compare different sets of data, then that would require a custom setup, perhaps Daniel can chime in more about how that might work, but that would be the only issue is just identifying which data goes with which child, which you could do with just the time frame if you know that your daughter's wearing it from March 1 to March 7, then obviously, then that's her data. And then your son switches for the next week. So that's not a problem. Is that, I think that's what you're asking? David: And that's good, and we'll see what Alison comes back with. We had a question about teacher access, so Emily, do you feel comfortable talking about the teacher access? How they share information with the teacher at this current time? Emily West: Yeah, definitely. So right now if you would like to share your login information with your child's teacher and you feel comfortable doing so and they're willing to work with you, that's a good way to get those updates during the school day so the teacher can sync with your child's device while they're at school. You can share you login with as many people as you'd like and they can download the app on their device, so parents, grandparents, teachers, counselors, everyone can be involved if they would like to follow up with the data and everything, you just have to be sure that you're all sharing the same login. One device can only be paired with one account. So that's important to note, if you have a teacher that wants to create their own account, they won't be able to sync the device on that account so you have to share your login. So that's how that works when you have a lot of people that are currently doing the app - hopefully we'll get some more information about how that's working out for them soon. But like Lara was saying, we do have that teacher resources page. We're going to share that link with everyone, correct? Lara Hill: Yes. We're planning to send a link to the recording as well as links to these specific resources. And the other thing I would add to that is if you have data that you want to share with a teacher, one workaround is to take a screenshot of ... like if you find a graph of this certain timeframe or you find that certain classes, you're seeing the focus rate go down, or whatever it is in the data that you're seeing, you can always just snap a screenshot, email that to the teacher or to the clinician or whomever you're working with, and that's a great way to just kind of show them some real data about the situation. And if you need any help with that process, taking screenshot, we'd be happy to help you. Just reach out to our support team. Daniel Baggott: And just to jump in on that question about users, there's a dropdown and you can change between users anywhere where it's useful throughout the app. So on the dashboard, for example, when you're about to look at a device or a user's data, anywhere throughout the app where it's useful, you can change between users and you can change which user has which device at any time. And that's separate from the data. So the data will always be with the user and you can change the devices between the users. Lara Hill: Yes, that's really helpful, Daniel, and if you have questions, if you want us to walk you through that process, we'd be happy to do that, so please do reach out and we can show you step-by-step how to do that. David: So we have a question about updates, I can answer the Plus update, so if you have purchase a Revibe Connect without the Plus plan we do offer the Plus plan for sale, one year of both data and the protection, and that's on our website currently for 79.95. And then Daniel, why don't you talk about the app updates, because we're doing a lot of app updates, can you give the group an understanding of how that happens? Daniel Baggott: Sure. The app updates roll out through the App Store, on most phones they are fully automatic. It's usually when you are not using your phone or when you connect to wi-fi so you have free data, so it will automatically download in the background a roll out. You can see your app version if you go to the menu in the app and click About. You'll see your app version. Also if you go in the App Store and you search up Revibe, do a search for the app in the App Store, it will show you if you have an update and you can do it manually. David: And you want to tell them what the version are currently? The most updated versions that are available? Daniel Baggott: So 1.0.2 is the latest on iOS devices and 1.0.3 is the latest on Android devices. We'll be rolling out an app update coming early next week and so that will likely change to .4 for both devices. David: Right. So we have a question about the schedule. If I have a schedule set up, will it not record focus score, attention span, focus rate, etc., outside the schedule? For example, it seems to vibrate and give tap requests, but if it is later than the scheduled time it is not adding the information to the app. Can you kind of go through, Daniel, the default schedule versus setting a scheduled event and what happens? Daniel Baggott: If you have no schedule, it follows a default schedule. That's most of the day. So that's just to help you get started with the device. So if you haven't input a schedule yet it will work most of the day when it's awake. That's any time you're using it throughout the day. Once you start adding schedule items, it will work within the schedule items in terms of providing vibration reminders within the schedule items. It will count things like steps throughout the day regardless, so your steps are fine, but for sorting the information and also for scheduling your vibration reminders, that's what the scheduled events are for. David: The homework is the Pomodoro method, did I pronounce that correctly, team? David: Okay, so somebody asked a question about that. Can my husband have the app so that he changes the mode if he is closer to the device when I am not? Or can the app be synced to one phone, tablet at a time? If multiple phones, tablets have the app, can they both sync the device? Daniel Baggott: So anyone who is signed in on the same account can sync to the device. So the devices are attached to accounts and so if you both have the same login, everyone can sync to the device. David: And then two kids, to separate logins or one login? Daniel Baggott: I recommend one login, if it's for example one family and they have two kids. Again, you can swap between users, so in the dashboard there's a dropdown, you can select which child you'd like to view the information for, which device you'd like to sync, all of the information works with multiple devices and users. Lara Hill: I'm seeing lots of questions and I don't know if we'll have time to get to them all. We will try to comb through these and see if we can reach out individually. The other thing is if for some reason we don't get to your question, please do reach out to us, support via email or we are here from 9:00 AM to 5:00 PM Eastern for phone support as well. There's some questions about if, I think it's from people who did not purchase the Plus plan, or you might not be sure if you purchase the Plus plan and how do you upgrade, that's something that we'll be emailing you about pretty soon. It's not available yet for you to purchase that from your device. Right now you're in a free trial which we're going to be emailing you about. We're actually going to extend that a little bit for you and when the option to upgrade is available, we will be emailing you. Most of the people on the call probably have the Plus plan, but if you're one of the customers who just purchased the device, we will be sending you a email shortly, probably in the next week or two, about what your options will be for upgrading. David: And also we saw some comments about the feel, the colors of the bands. We are going to be coming out very soon with two additional colors at this point, purple and blue, and we changed the finish on those bands to make them softer and more comfortable. I'm currently wearing a prototype of the blue right now and it's definitely very comfortable. So we're looking forward to being able to get the information out for those very soon for you folks. We wanted to give you a heads-up on that. There's a question about the schedule block and some of the schedule adjustments, and Daniel, I'll say what I know and then you correct me or make any adjustments. We definitely see that there are some challenges with folks that have rotating schedules and the device does not match up to the rotation of the schedule the way they are currently and we are looking into that. We don't currently have a ready-made improvement for that at this point. Is there anything you wanted to add to that, Daniel? Daniel Baggott: I think that's right. Right now, the scheduling is done via the seven day schedule that exists. There will be a online client, a web client available, but it's several months out, it requires some extra technology to be able to deploy things different through the browser and interact through the browser, so that may be an option in the future, would be to go online and to change your schedule in the computer, that might be easier for some users. Additionally, we can look at that in the future in a different way, but currently we just use the seven day schedule. Emily West: I have one suggestion, actually, for those that have A, B days. Since you can only do the one week schedule kind of thing, what I've suggested to a couple people is to set up two users for the same child, maybe say like Emily A and then have Emily B, and then you can have under Emily A the schedule set up for those A days and then Emily B would have those B days and then you would switch between users on opposite weeks or things like that, for example. That's kind of one workaround that I've found has seemed to be working. David: Great, Emily, appreciate that. Any other questions we see before we close out? Lara Hill: I think if any of you have questions about your specific order, your specific, like if you have Plus or when does your trial run out if you don't have Plus, anything like that, please do reach out to us, we'll be happy to look up your order, or if you still have the email you can look and see. If you purchased the Plus plan, it'll say that on the order confirmation. If you have any questions please do reach out to us, we'd be happy to help you. David: Do we want to end with maybe some quick best-practices from each one of us? Or things that we've ... Emily, that was a phenomenal best-practice that you just shared with the group that you've been talking to folks about. Daniel, we'll start with you, anything that you've been talking to folks about that you want to make sure that people on this know that you've seen is a trend and a practice that you can help them out with? Daniel Baggott: So setting up the schedule is useful for the adaptive mode. Some users set up one block, but I recommend setting up a more detailed schedule for the adaptive mode. Make sure your devices are charged and close by. Additionally, because Bluetooth counts as a location, because Bluetooth items are in a location physically, on Android they require location permission. That is not GPS information, that is not location tracking. That is just having access to nearby Bluetooth devices such as the Connect. So the app will request that permission, so that's what that permission is and does need approval to interact with the device. So I think those are my primary tips. David: Okay, great. Emily, thoughts on your side? Emily West: Well, there's one thing, I've had some people wondering about changing the time on their device, so I just wanted to say in order to change the time you have to sync your device. There's no manual way to do this, so if you take your device and then you charge it up, when it comes back to life it most likely is going to be the wrong time so you have to immediately sync it for it to address and then it will automatically change itself to match the time zone that you're in. Lara Hill: And I'll chime in on my two cents as far as along those lines of keeping it charged, I just like to encourage everyone to develop a routing and just to have your child get used to wearing it consistently on the weekdays if you're not already doing this. I think in general it's helpful just for kids to have a routine. If they know in the morning they're putting on their Revibe before they're going off to school, when they get home after they finish their homework as part of their bedtime routine, part of that is putting it on the charger station, letting it do a nice full charge, and then a nice sync while you're connected to the wi-fi. That way it's on a daily basis getting not only just a full charge but it's also getting a sync so that you're not losing any data. I did see some comments on Facebook about people being concerned about losing their fidget data if they choose the quick sync option. If you're doing this as a routine every evening, there shouldn't be an issue with needing to do the quick sync. It's a nice option to have if you're in a pinch, but just developing that consistency I think is really helpful for the child, not just because of the benefits of the device but just in general it's nice for them to develop those time blocks where "okay, I'm at school, I'm developing the habit of being focused and alert and attentive and even during homework", but then in the evening, "it's my time to relax, I can put that aside", on the weekends, "that's my time to relax and play and put that aside". I think it just helps with general lifestyle to just have that consistency as part of the daily routine. David: That was well said. I'll second that based on wearing my device now for six months. Almost a hundred percent regularly. I have my routine every morning. My phone's charged up. My Revibe's been charging. I sync those up as I'm just getting ready for the day. It's worked out really well. All the other stuff you said Lara was great. If there's nothing else, do you say we close out? Let folks have the rest of the evening to themselves? Lara Hill: So I just want to say before we go, thank you all so much for taking the time to be here. I know everyone has a busy schedule and it's really important to us that we're able to support you and give you the information and be here for you as much as possible so thank you so much for taking the time to better understand the device and the app and everything that goes along with it. We just appreciate your support so much, especially in this early phase of this new product. So please keep us posted how things are going and we'll be in touch with you as well via email. So thanks everyone. Thanks team. Please feel free to reach out to us at support@revibetech.com or 919-521-8444 if you have any additional questions after viewing!